You, Me and Movies: Review: "Suburbicon" is a place I wouldn't recommend visiting. Not quite. Review: "Suburbicon" is a place I wouldn't recommend visiting. Not quite. Man, I was really thinking I was going to love "Suburbicon." The film is directed by George Clooney, who, believe it or not, is a good director. I loved "Confessions of a Dangerous Mind," "The Ides of March" and "Good Night and Good Luck." I also thought "Leatherheads" was a pretty decent film too. He is working from a script by none other than the Coen brothers. The film stars Matt Damon, Julianne Moore, Oscar Isaac and Glenn Fleshler. I thought for sure this was going to be a movie I would have lost my mind over. I sat on the film for a whole day, and now I can't believe it. But my mind is boggled that I didn't love it. In fact, I am a little deflated that I didn't love it. It's frustrating because there is lots to like about this movie. "Suburbicon" is a film that is full of good performances. The cinematography by Robert Elswit paints a 1950's suburban nightmare. The grimy promise of an American Dream with a dark secret at its core. The music by Alexandre Desplat is a remarkable one, setting mood with some simple key notes. The thing is, there is lots of extra that makes this movie look and sound good, but that doesn't carry the movie. I have written before on this blog about the dangers of putting multiple storylines in one movie. It's unfair to treat movies like mini-television shows and it takes someone really special to juggle several storylines at once. 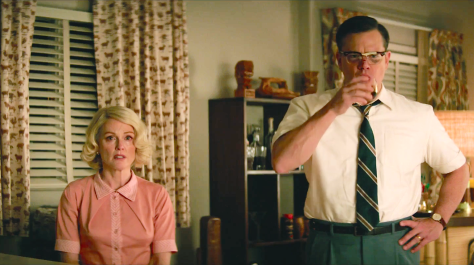 The problem with "Suburbicon" is that two stories take center stage. One story revolves around the Mayers family, the first African-American family to move into this nice little slice of Americana, the problem is that the town is all white and as soon as word gets out that there is a black family in this all white community, things get hostile in a quick! The entire neighborhood wants them out. Then there is the story about a robbery in the home of Gardner Lodge (Matt Damon) and his wife Margaret (Julianne Moore). Their son Nicky (Noah Jupe) watches from the dinner table as his family is put to sleep and robbed, and when he awakens, he learns that his mother died during the attack, leading Margaret's twin sister Rose, also played by Moore, moving into the house. Things aren't what they seem in the Lodge household and Nicky soon realizes that he never really knew his father ever. Nicky spends a lot of time with the Mayers son Andy (Tony Epsinosa), and it appears that Nicky may be the link between these two stories, but perspectives switch like the wind blowing and the stories are so willfully disconnected that it becomes disjointed quickly. The tonal shifts of each story work against each other, not for each other. Dramatic comedy is a real chore to capitalize on and as good as the Coen brothers are, even they don't always get it right. I think Clooney comes close to making the stories and the humor land, but some of it falls flat. There is never a good firm grasp of the tones, and the film feels like a scattered mess throughout much of its running time. I didn't know whether I should be laughing or gasping from horror and that uncertainty worked against the film. The other problem is that George Clooney never really makes the film his own. I think its really interesting that if you look the movies he's directed so far, he's never really identified a certain style as his signature. "Good Night and Good Luck" doesn't look like "Confessions of a Dangerous Mind" and neither of those films looks like "The Monuments Men." But I think Clooney was able to make you feel his vision through each of those films. With "Suburbicon," it feels like he is leaning on the style of the Coen brothers so heavily that he never makes the film its own, it feels too much like a stunt. Before I did some research, I actually firmly believed that this was a Coen brothers movie, and Clooney could certainly be a "ghost director" for the brothers. But Clooney never makes it his own, this feels like a karaoke movie, instead of something of its own. I will say that Noah Jupe does great work as Nicky and he handles some emotions that I think the average adult actor would have difficulty with. I don't even know how you explain to a child the material he has to play here, but he does so without blinking an eye. Damon is good here, a seemingly innocent man who becomes more vile as the film wears on. Moore has played characters like this before, and she proves that she has real control of her craft. Oscar Isaac shows up as an insurance fraud investigator, and he pops in and does some good work and gets out. Isaac is on the rise of being a big star and he proves his range here. But the power behind this film is done through Jupe, a grand child performance. I can also say that the film does seem to have something on its mind. I can tell it has something important to say, even if it is a little muddled in its message. I can get that we as humans have a bad habit of pointing the finger at those over the fence, those in other regions of the world, those we don't trust. When in actuality, the people we should be regulating the most are those that live right next to you. One of the best moments in the film is the opening credit sequence, when an informational film about living in the town of Suburbicon plays out, just like they used to do in the 1950's. I love movies about communities who harbor secrets, innocent towns that have a dark heart. But the tones are all over the place here that I can't focus. If this is a dark movie, then why don't I feel unsettled? And if this is supposed to be a comedy, then why am I not laughing more? George Clooney is a good director, and one minor misstep won't change that. He gets lots right here, which makes "Suburbicon" more frustrating then just another down-the-nose bad movie. There is lots of thought and meaning in the scenes of this movie, even if I don't think they quite add up. George Clooney will make another complete film. "Suburbicon" just doesn't add up to anything.